Born in Twin Lakes, New Mexico in 1966, Daniel “Sunshine” Reeves is an award-winning Navajo artist of many talents. Sunshine learned the art of silversmithing from his older brothers at the age of 24 and has since become an innovator in the realm of his craft. From bracelets and belt buckles to boxes, knives, bowls, and candle holders, Sunshine Reeves’ intricate stampwork on silver is rooted in tradition with eyes toward the future. 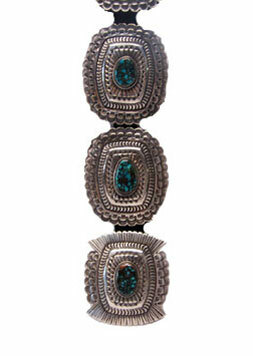 Desert Son of Santa Fe carries Sunshine Reeves belts and buckles. Contact our shop for inquiries on our current inventory.